RTÉ offers an unrivalled subtitling service to Irish television audiences. During peak time - 6.30pm- 11.30pm - RTÉ subtitles up to 90% of programmes on RTÉ One and up to 60% of programmes on RTÉ 2. Subtitling translates the spoken word into text or script, which appears at the bottom of the screen in time with the programme or film. How can subtitled programmes be accessed? 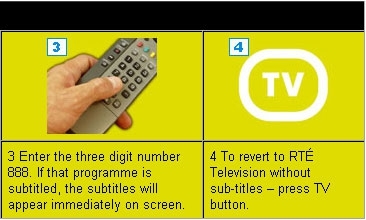 To access subtitles on RTÉ you must have a teletext facility on your television. Subtitles are accessed through RTÉ Aertel page 888. 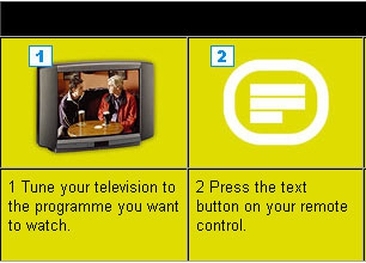 Tune your television to the programme you want to watch. Press the text button on your remote control. Enter the three digit number 888. If that programme is subtitled, the subtitles will appear immediately on screen. To revert to RTÉ Television without sub-titles - press TV button. How will the Digital Switchover affect me? What time did the problem start? What is the name of the programme? What area you live in? As Ireland's Public Service Broadcaster, RTÉ prides itself in constantly improving and upgrading its subtitling service. RTÉ keeps in contact with deaf and hard of hearing viewers so that their recommendations can be considered and if possible implemented. Déanann fotheidealú an chaint a aistriú chuig téacs nó script a fheictear ag bun an scáileáin, ag luas an chláir nó an scannáin. Section 26 (1) of the Disabilities Act 2005 requires a public body to provide access to its services to people with disabilities where practical and appropriate. RTÉ (Raidió Teilifís Éireann) is Ireland's national public-service media organisation. A leader in Irish media, RTÉ provides comprehensive, cost-effective, free-to-air multi-media services to the public in Ireland and interested audiences internationally. Address: RTÉ, Donnybrook, Dublin 4.